Beyond the halls of middle school, braces may seem like a daunting undertaking, but our Sunset Hills MO orthodontist does not want you to fret. Today, more and more adults are having their teeth properly aligned, and the options to do so are no longer limited to traditional braces alone. A perfect smile may take time no matter which approach you choose, but the benefits will last a lifetime. Traditional braces are made of stainless-steel wires which are affixed to metal brackets on the teeth with plastic ligatures. The ligatures come in all colors of the rainbow—a hallmark that many tend to associate with the pre-teen days—but a variety of more neutral colors are also available. Traditional braces call for the patient to return to our Sunset Hills orthodontist about every six weeks to have wires tightened, corrective shifts, and ligature removal and replacement. Cleaning and brushing can require some diligence, especially as your gums and cheeks adjust to the new addition. Many orthodontists say Invisalign is one of their most asked-about products for teeth alignment, and it’s easy to understand why. 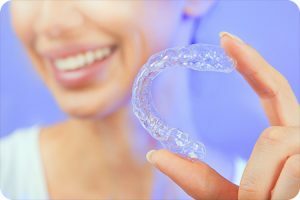 Invisalign works to alter the alignment of teeth using clear, plastic trays molded to your bite. That’s right—a metal-free solution. Our Sunset Hills orthodontist will set up a consultation to examine the particular needs and measurements of your smile and a series of trays will be produced to gradually alter your smile over time as you graduate from tray to tray over 12-18 months. Clear ceramic braces are similar to traditional braces, but rather than the brackets being made of metal, a white or tooth-colored material is used instead. The look is therefore more discreet than metal braces, and may be a great option for those who prefer a less visible look but still need more extensive treatment than a removable option can provide. The ceramic and light ligatures have been known to stain from foods like curry or beverages like black coffee. However, in recent years, technology has continued to advance, and our Sunset Hills orthodontist can offer the most durable, up-to-date options. Additionally, regular adjustments and ligature replacement should mitigate this concern.